Liberal legal systems can make economic life predictable, but have a spottier track record protecting the interests of those who lack economic power. Heading into the 2020 political cycle, what role do (or could) US institutions play in aggravating or lessening economic liberalism’s downsides? Join CCSI, the Institute for the Study of Human Rights, the Saltzman Institute of War and Peace Studies, and the Columbia International Arbitration Association for a discussion with three authors on their recent books on this tension. Samuel Moyn is professor of law and history at Yale, and the author of "Not Enough: Human Rights in an Unequal World ." 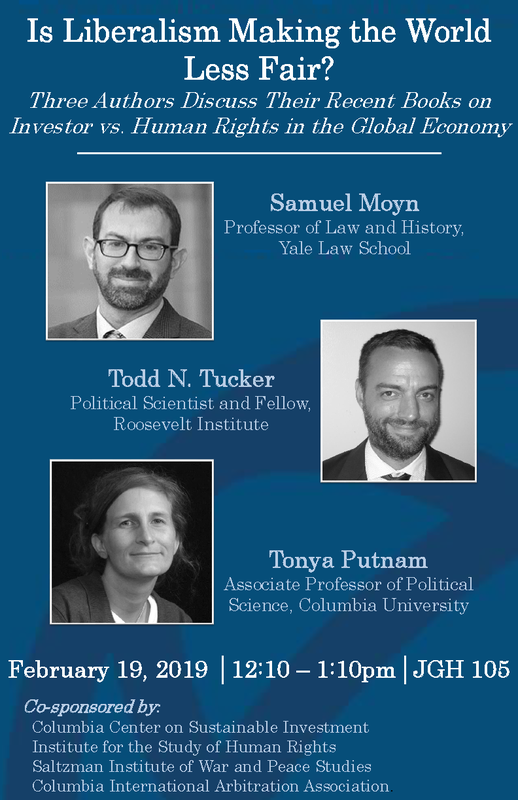 Tonya Putnam is associate professor of political science at Columbia University, and the author of Courts without Borders: Laws, Politics, and U.S. Extraterritoriality.